The first time I met Jawad I was totally stunned by his musical skills. He began with a long solo, his fingers moving so fast on the surface of his Persian drum we could no longer distinguish their individual movements. He hit, he played - his stroke on his Tonbak produced such impressive sounds he sent the entire audience under a spell of euphoria. Even after he stopped playing, everyone seemed in a deep trance. The Persian percussionist had charmed us with his dynamic interpretation. So I decided to have a chat with Jawad to bring you more from this amazing artist. 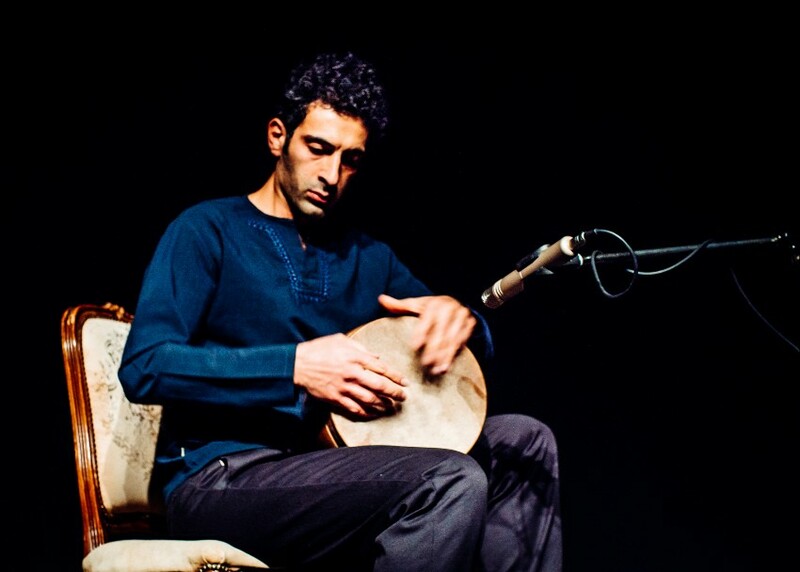 Born in a family of musicians in North of Iran, Jawad Salkhordeh began playing the Tonbak, a Persian hand drum and one of the main instruments of Iranian classical music, when he was fifteen. He just picked the Tonbak one day for a school event, unknowingly picking a passion for self-expression. In 2004, Jawad began learning the art of the Tonbak from the world-famous Bahman Rajabi a Tonbak master - and continued for the next two years. Upon mastering it, he played three concerts in the Golestan Gallery, lived and played in Paris and Cologne before moving to Berlin in 2010. Mary Toque: Jawad, you settled in Berlin? Jawad: I just wanted to learn a new life and a new culture. After a concert in this amazing city, I have decided to stay. I am well settled in Berlin and have a lot of friends. Mary Toque: Music is your passion, we know that. Can you tell us why the Tonbak inspires you? Jawad: The Tonbak is my favorite instrument, though I also play the daf, a frame drum, the udu, a kind of vase, and various other hand drums. I also learned the Sittar from friends. Mary Toque: Do you live from your music? Jawad: Yes, I perform with different ensembles and also give Tonbak and daf lessons at my home. However, it is difficult to secure my living from it, particularly because my instruments are still unfamiliar here. Mary Toque: You are playing in different bands. Can you tell me more about it? Jawad: I play classical, folk and world music. Currently, I am working with Yahya, a Persian ensemble, with cousins in Paris. We always interpret two styles of music, classical and folk music. We try to present a mix of old traditional pieces with new arrangements and original compositions. Otherwise, I have six months before a new ensemble, Mehrava, founded with the Santurspieler and composer Reza Aref Rafat Boroon and singer. Mehrava means the voice of love or affection. Together we only play classical Persian music. My main ensemble Sistanagila is a Berlin-based Jewish band with musicians from Israel and Iran. We do not feel connected to political tensions between the governments of our countries of origin. Quite the contrary. We want to show that art overcomes these limitations. Music is our language, and what brings us together. Mary Toque: How do you compose songs in Sistanagila? Jawad: Every musician tells the group what he likes to play. Ido Spak is a pianist and likes jazz; our guitarist, Hamed Darabi, likes to play Happy Metal. I myself mostly play classical, folk and world music. Yuval Halpen, a singer and artistic director, and Ido Spak compose our pieces together. We mix folk melodies from traditional Persian and Jewish music with modern arrangements, which can be inspired by both contemporary and older poetic texts. When we play live, we try to improvise as much as possible. Mary Toque: You mentioned 'world music' as a genre. What does this term mean to you? Jawad: World music for me is a mixture or a fusion of various traditional music styles that create something new. As in Avishai Cohen, where Jewish and Arab elements flow together with jazz, Sistanagila fuses Jewish and Persian melodies.